So, my first recipe here would be appropriate for the upcoming Chinese New Year. Noel's dad says that the price of bak kwa is now about $38 per kg! 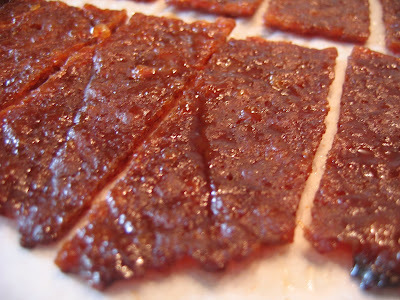 Well, here's a fun (and cheap) project to do for Chinese New Year - make your own bak kwa! I found the basic recipe from tazzinthekitchen.blogspot.com, and like all intrepid investigators, I followed the trail of her bak kwa recipe to an obscure Taiwanese text. The internet has a few other bak kwa recipes (I tried googling "rougan", "rou gan", "bbq pork", "pork jerky", etc. ), but most required long hours of marinating, drying the meat in the sun, and one even required the meat to be sliced in a specific manner. 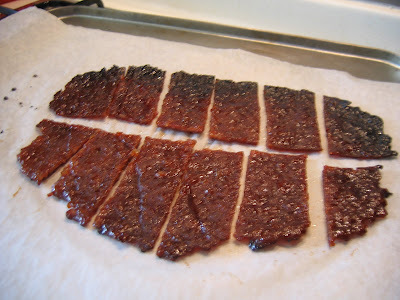 I've tweaked Tazz's recipe because the bak kwa turned out too brown. To get the lovely red colour, I added Red Wine Dreg (or Fermented Rice Residue) or 红糟. 1. In a big bowl, add the seasoning to the minced meat. 2. Stir the mixture with a pair of Chopsticks in one direction, until minced meat becomes like glue. 3. Put some (or all, depending on the size of your oven and baking tray) gluey minced meat on a baking paper (You can buy this paper in the supermarket. It's used to line the baking tin for baking cookies.). Cover the meat with a big cling wrap or plastic sheet and use a rolling pin to roll the meat to about 2mm thick. 4. Remove the plastic sheet and put the entire baking paper with the minced meat on a baking tray. 1. Bake in preheated oven at 125 deg Celsius for 20 minutes. 2. Then increase the temperature to 180 deg Celsius and bake for about 15 minutes. 3. Remove the baking tray from the oven and let the meat cool for about 5 minutes. 4. Flip the meat over onto a fresh baking paper and bake for another 5-10 minutes at 180 deg Celsius. 5. Cool the bak kwa and cut into pieces* before storing in air-tight container. *Be creative! 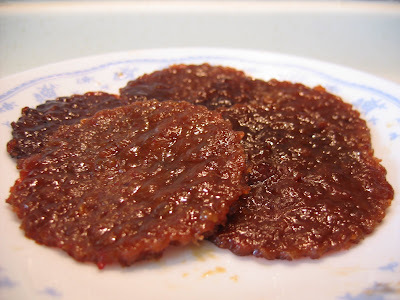 You can use a cookie cutter to cut the bak kwa into round coin-shapes or any shapes you fancy. Cecily of cookbakelegacy.blogspot.com, hit upon using char siew sauce in place of the Fermented Rice Residue and Fish Sauce. Although I haven't experimented likewise, I thought it is a distinct possibility in tweaking the recipe in the right direction. You can read more about her bak kwa here. Can you tell me how long you can store Bak Kwa for and if in the freezer how long for? hi brenda, wow, ur bakwa turned out quite amazing! but can i know where can i buy the red wine dreg? 1 cup is how many grams or ml? What is Hua Tiao Jiu? wow it looks so yummy!!! can you use red food colouring instead of red wine dreg? oh oh oh!! i'm going to try it some time.. hopefully will work out!! I have made a very similar version to this twice in the past 10 days. It is very easy, and for my taste, I increased the seasonings for everything on my second batch. I think the next time I make it, I will take the final cooking time, ad do it on the grill instead of the oven for the char flavor. Hi I stumbled into this site, and I have tried it out with a friend. Though the 1st 2kg was not as perfect for the each of us, I have decided to do it again. This time I will try to improve on the presentation. But I can tell you, the 2kg did taste good! And the 1 kg attempt which I am about to grill tonight is going to be great as well! Thanks for the recipe. When it cooled down, my daughters "sit on it" while watching tv -- like eating popcorns! I will surely cook this one again. O shakes! Im really gonna try this! The commercial ones are sweeter than mine. Should I add more sugar?